In 2014 Michel Lambert and I toured in Poland, Russia and the UK. We stopped by Birmingham, Newcastle, Hadley and London. I have the good habit of recording all my concerts and year after year it has been very gratifying. FMR Records has already published five fantastic albums from our previous peregrinations. This time we are happy to release this amazing live recording from The Vortex Jazz Club with acoustic bassist John Edwards and legendary pianist Steve Beresford PLAYING with Michel and I. OUTgoing is, above all, music of absolute spontaneity and pure joy! Montreal-based musicians alto saxophonist François Carrier and drummer Michel Lambert have played together and been inseparable for so long that their knowledge and understanding of each other’s instincts verge on the telepathic, meaning that they seem to play and think as one, giving their music an easy, natural flow and logic. 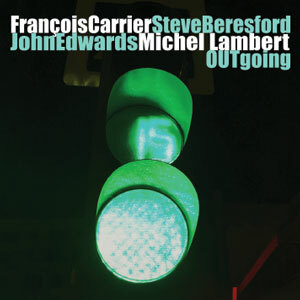 The list of musicians Carrier and Lambert have played and recorded with is impressive (including Paul Bley, Gary Peacock, Dewey Redman, Mat Maneri…) But, following Carrier’s recognition in the 2013 Downbeat and 2015 El Intruso polls (alongside the likes of Tim Berne and Steve Coleman) other musicians will surely be proudly listing him as someone they’ve played with. Carrier and Lambert have toured the world for years, establishing links in many countries, particularly Russia — as evidenced by the release of five fine albums, between 2011 and 2014, with Russian pianist Alexey Lapin. With the benefit of hindsight, Carrier’s six-month stay at the Québec Studio in London, in 2011, can be seen as important to his music and album releases since. The saxophonist and drummer formed a strong bond with various members of the London improv scene, playing concerts with them at St. Leonard’s Church, Shoreditch, and the Vortex jazz club, Dalston. Since 2011, Carrier and Lambert have been regular visitors to London, and have played gigs there at every opportunity. OUTgoing was recorded in concert at the Vortex in May 2014, with a quartet completed by Londoners bassist John Edwards and pianist Steve Beresford, making this album a companion-piece to Overground to the Vortex (Not Two Records, 2013) which was recorded at the same venue, by the same foursome, back in December 2011. The five tracks here, totalling over seventy-eight minutes, represent the two sets played by the quartet that night. As always with Carrier, all the music was freely improvised and seems to have come easily to all concerned. On the first two tracks — the first set — Carrier, Lambert and Edwards played as a trio. After the interval, they were joined by Beresford who shifted the soundscape and acted as a counterpoint to Carrier. The introduction of piano keeps the music fresh and gives the album variety. Also, as a change from alto sax, Carrier includes occasional interludes on Chinese oboe which provide a contrast but dampen the momentum as his playing on the instrument is not as fluid as his saxophone. In all respects, this is a very welcome addition to Carrier and Lambert’s burgeoning discography. Highly recommended.